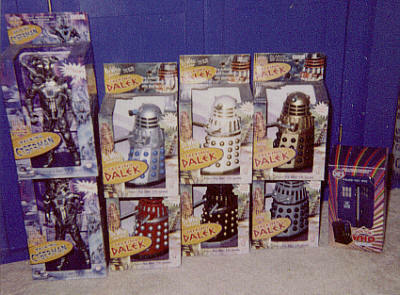 A resident of Round Lake Park, Illinois in the United States, Tim has been a collector of Doctor Who merchandise and books since the late nineteen seventies when Target was releasing the TV Show novelizations in the USA at a very fast pace. His collection was mainly books until the Internet opened his eyes to the vast amount of other items available. Since this revelation he has been expanding his collection as fast as his bank account will allow. Growing so quickly he was forced to build a database to keep track of everything. 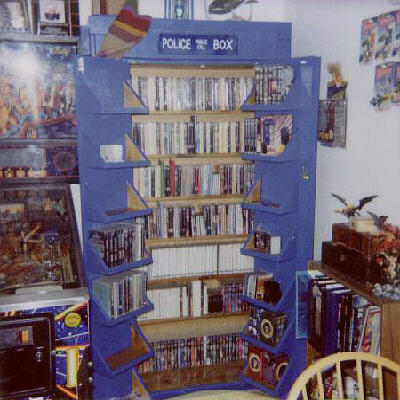 Currently his collection contains a paperback copy of every novelization ever published by Target, the five unpublished episodes available from the New Zealand fan club, and the two Virgin published second Doctor/Dalek stories. Tim also has every Virgin novel, new adventures and missing adventures as well as all of the BBC and Telos released stories. Add to that all of the Big Finish audios, short story anthologies from multiple publishers, board games, PC games, reference books, posters, DVDs, toys and any other items he can get a hold of. 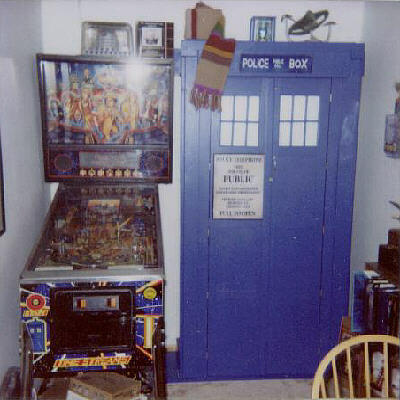 Tim's game room is dominated by a Bally Doctor Who pinball machine, which sits next to his personally designed and constructed TARDIS bookcase. Tim created his own Doctor Who chess set using 25mm Harlequin Miniature pieces including all eight Doctors and every version of the Master as the kings, all of the companions as the white queens, assorted members of UNIT as the other white pieces and a Dalek patrol as black pawns among other pieces available. Tim would love to get his hands on a full sized motorized talking K9 replica and a full sized Dalek when he has the space and budget to handle it. Cursed with the collecting bug in general, Tim is blessed to be married to a wonderful woman that understands his addictions and lets him peruse these interests. In addition to Doctor Who merchandise Tim also collects Lord of the Rings battle pieces and guitars. Tim's Bally Doctor Who pinball machine and the custom TARDIS cabinet he built. The cabinet has a set of lights inside that go on when the doors are opened and a flashing blue light on top. 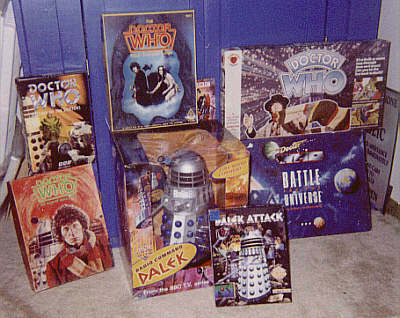 The cabinet was on display at the 2002 Chicago TARDIS convention. The TARDIS opened to expose all the storage and goodies inside. A selection of toys from Tim's collection. All of the pictures on this page are the property of Tim Michels and may not be used or reproduced in any way without his explicit written consent.